“Only with Her it is possible; everything with You and nothing without You'. A group of 25 kids from the province of Manabí (Ecuador) HMY, along with Bryan Alava, ASHM; Anaum, LHM and Fr. 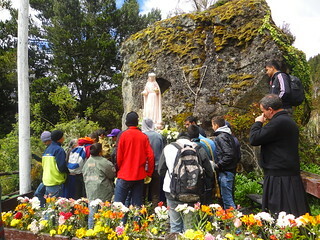 Dominic, SHM went on a pilgrimage to the Shrine of our Lady Guardian of the Faith in Cajas, Azuay province, located in the North of the country. The bus departed from Playa Prieta on December 16th at 3:00 a.m., stopped in Guayaquil to pick up Fr. 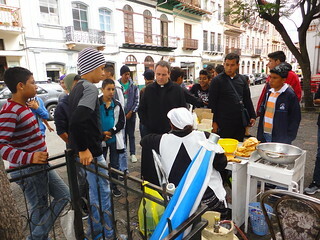 Dominic and to have breakfast, and then went to the first destination of the pilgrimage: Cuenca. There a most splendid sun shone at the highest point as a welcoming sign to the pilgrims who visited the Cathedral. We went on to visit some more churches, and then stopped to have lunch. In these places, we could contemplate the beauty of the temples and the devout religiousness of the faithful. At 5:00 in the afternoon we set off to the place where we would be lodging during the pilgrimage. During the trip we alternated jokes with moments of prayer, and in this way we passed the time. We were eager to arrive to celebrate Mass, eat something and rest. Although it was very cold, we practiced works of mercy, helping each other out, and sharing the warm clothes that we had brought. The following day we spent exploring the place where we were staying, the lagoon of Busa. In the morning we had time for prayer and at 9:00 a.m. we organized a hike to the mountain, which for some was easy but for others, it was tough. Although we did not reach the top, we came to the highest point that we could. Later we stopped to have lunch there and next we went down the hillside, since some young people were anxious to swim in the lagoon to reach the image of Jesus's Heart, which is placed in the middle of the water. The low temperature (9 ºC) did not prevent us from throwing ourselves in it with excitement. Then, Fr. Dominic celebrated mass. In the homily he compared the physical effort that we had made in the mountain with the spiritual one that we must do to achieve Holiness. Before going to sleep, Father gave us a brief talk with points to reflect on, and at the end of it some young boys wanted to go to confession. On Friday we pilgrimaged to the Shrine of Our Lady of the Cloud in Azogues, where we lived another adventure in which the spiritual fruits of the pilgrimage began to be seen. Everyone wanted to help Joao, a young man who could not climb the mountain because a month earlier had fractured his foot. This time many made it to the top, it was worth doing so. We were stopping at every station of the cross that was on the mountain and we would say: “Jesus suffered more going up with the cross, so I can do it”. In this way we were filled with strength to continue climbing. Half an hour later, we went down to meet the rest of the Group and have lunch together. Then we organized some fishing in the lagoon. After a long time, someone caught a trout and initially thought about eating it, but he ended up setting it free. We celebrated Mass and then had dinner. After this, Fr. Dominic gave us a talk on the rational use of new technologies, since some of the guys are very attached to their mobile phones. Later, the time came to go and rest for the big day: the last, but certainly not the least important. Saturday we got up earlier than usual, at 6:00 in the morning. We had breakfast quickly and went to the Sanctuary of Cajas to visit Our Lady Guardian of the Faith, to whom we had entrusted the whole pilgrimage to. Upon arrival it was raining and was very cold, 2 ° C, so we headed straight to the chapel where we would have the Mass of Thanksgiving. To conclude, we headed to the image of the Guardian and the rain ceased, the sun came out, followed by a strong wind, with which we clearly saw the joy of Our Lady, and we joined in Her joy. The boys joyfully prostrated themselves in front of the image. Some renewed their commitments with the Home and said that it was a great grace to be able to be there. Others commented that it was the first time that they had experienced the feeling that someone was with them and that the Virgin Mary had fixed her gaze on them. These have been memorable days for all. It is clear that the Lord and Our Mother are generous pouring graces on those souls who are willing to receive them with total openness. 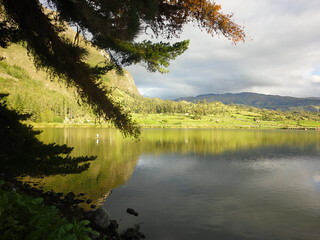 -The pilgrimage to the Sanctuary of Cajas helped me a lot, it is a very nice place, not so much exteriorly, but spiritually, which is fabulous. There you will feel the presence of Our Mother. I have received many graces from the Virgen Mary. Long before going on the pilgrimage, I prayed to be able to be there asking her to help me to go to the place where She has been. Thanks to the “Little Guardian” I overcome many obstacles and I was able to move forward. - The Cuenca pilgrimage helped me to be more united to God, Our Mother, and others because each fall made me think about what I was doing with my faith which was disappearing in my life. Trying to climb the mountain I realized that I can regain the same level of faith that I had before, and even more. - It has helped a lot to have gone on the pilgrimage as it helped me to learn how to do things with love, and to help others. The presence of the Virgin Mary that I felt filled me with great joy. -The pilgrimage was great, it helped me a lot and something that I have to say is that it was the first time I prayed with great love, with concentration and feeling so close the presence of Our Mother.